From the reviews I’ve read of the Magdalen Arms (243 Iffley Road, OX4 1SJ), the foodies of Oxford (and beyond) think it’s either the best gastropub in the city or completely overrated. I had been looking forward to both trying the food and seeing whether it was a good place to take a baby. So the Baberoo, her Gran, and I recently dropped in for a weekday lunch. We had the place nearly to ourselves – always nice when you have a baby carriage to manoeuvre, and also really handy when your baby is the impatient type and doesn’t like waiting too long for a meal to arrive. During the short wait I tried the homemade quinceade (£3); it had a nice sharp tang to it but tasted so much of lemon that I thought they might have misheard me and brought me a homemade lemonade by mistake. They hadn’t. Our server asked if I wanted more quince syrup added. I did, and the drink turned out sweeter and faintly quincey – but still tasted like (very good) lemonade. 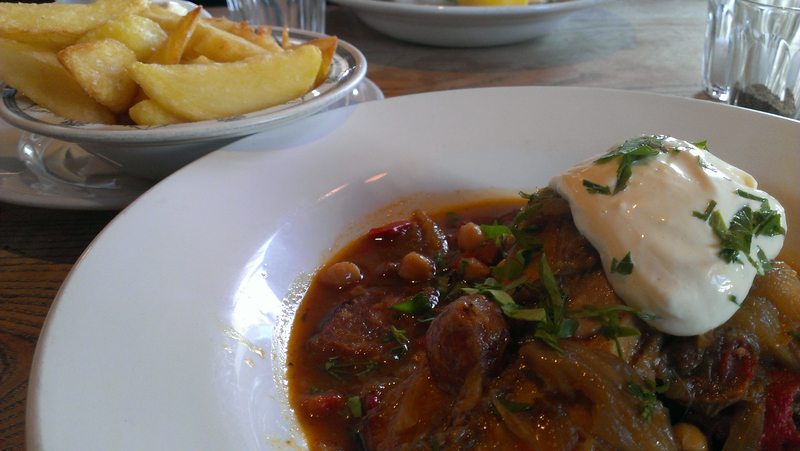 For my meal I ordered the wild rabbit with chorizo, fennel, chickpeas, and aioli (£14), as well as a side of chips (£4.50). Although the chorizo/fennel sauce was flavourful it didn’t help tenderize the rabbit, which was too tough. The Baberoo was having none of it. She didn’t want the chips either, even though they were pleasingly fluffy on the inside with a delightful crispy exterior. What, you say? You tried to feed your baby a dish containing wild rabbit and chorizo? Yes, we’ve done baby-led weaning with the Baberoo so she is a very adventurous eater; she will usually eat (or at least try) just about anything. That’s why I sometimes order a dish and share it with her – yes, even rabbit – rather than bring food from home for her or order from a baby menu (although I’m happy to do that too). If she doesn’t like it, we always have a back-up snack bag, which I had to pull out on this occasion. But when she does like a dish, it goes up in my estimation at having been pretty darn good. Unfortunately, I’d say the rabbit didn’t reach that level and I’d call it an OK but not great meal. I wished that I had saved room for dessert; their long list of offerings all looked fantastic. So, now that I’ve come down somewhere in the middle (not loving it, not hating it) about the food, what did we think of the establishment’s baby-friendliness? I rate eateries against five factors: menu, space, ambiance, facilities, and feeding. For more about these, please see my About page. Menu: There’s a lot of meat on the menu and most of it comes in big hunks, so you’ll need both hands free for those dishes. On the day we visited there was a pasta dish and a few starters (soup and tapas) that could be eaten with one hand if your other arm needed to be free to hold a baby. The cod also would have worked. The menu changes daily and it’s not posted on the website, so you’ll have to go along and take your chances on there being something you can eat one-handed if that’s a necessity for you. Space: The entrance to the pub isn’t terribly baby-friendly; there are three stone steps and then two sets of doors, so if you have a baby carriage you might need some help getting in. 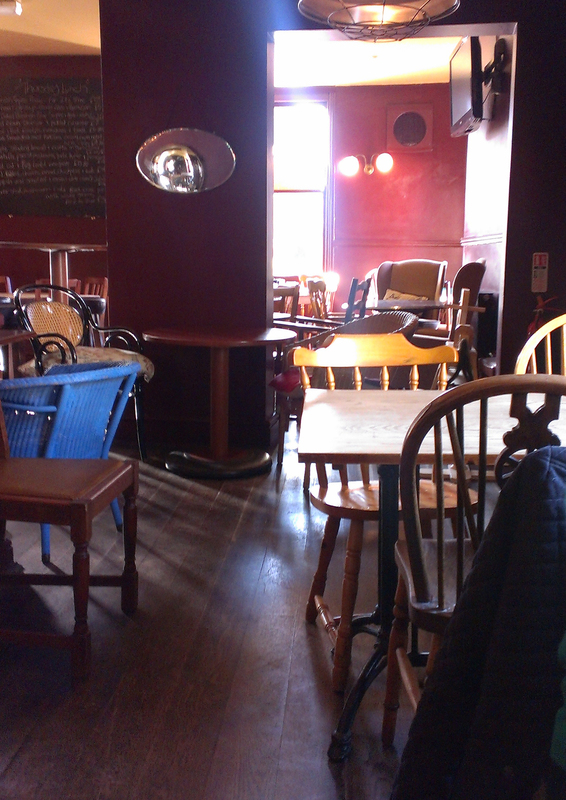 Once inside, you’ll have to manoeuvre through a space that’s quite full of (quaintly mismatched) tables and chairs. If the place had been full we might have had some trouble getting to a table. Ambiance: The walls are painted such a dark and sombre colour that the overall effect is somewhat dreary; I’m guessing it comes into its own and is much more animated in the evening. The staff, though, were very friendly and helpful, and enjoyed chatting to the Baberoo. Our server was happy to get us extra napkins and direct us to the baby-changing facility. They also have high chairs available (the Ikea kind, which I find more secure than the usual restaurant model). Facilities: The baby-changing facility is a pull-down table in the ladies’ loo, which is down a flight of four stairs. There’s a mini-lift for wheelchair users that I guess you could also use with a baby carriage if you wanted to bring it into the loo with you; I just held the Baberoo and left the carriage at our table. 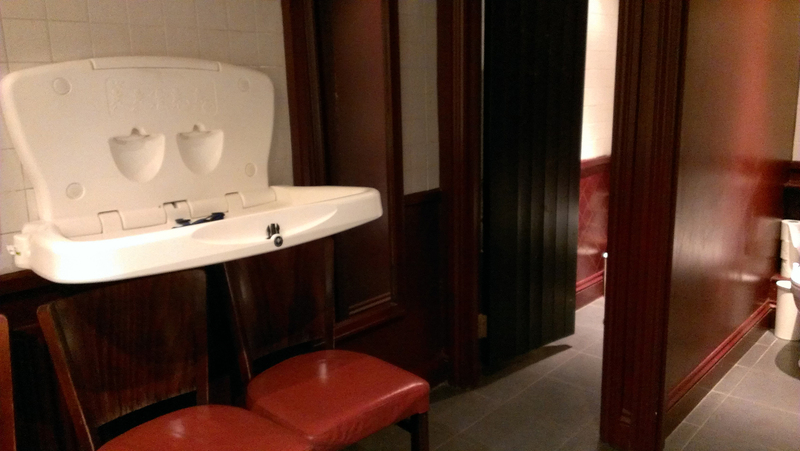 The pull-down table is in the main area of the loo, while toilets are in separate cubicles. Some chairs were set up underneath the pull-down table, which was really handy for putting the diaper bag down and organizing our things. The whole ladies’ room was clean and tidy. Feeding: If you’re breastfeeding, choose a table that has comfortable-looking chairs. There are so many different kinds that there’s sure to be one that suits you; my personal choice, if I’d needed to breastfeed, would have been one of the padded armchairs of different vintages near the front of the pub. I was hoping the Baberoo would eat part of my regular-food lunch, but we resorted to the snack bag; I would say that the menu at the Magdalen Arms isn’t particularly kid-friendly (unless your child’s sophisticated palate is attuned to the tastes of, say, rabbit and pork rillettes, blue cheese souffle, or potted shrimps). The final score for baby-friendliness for the Magdalen Arms is 6.25 out of 10. 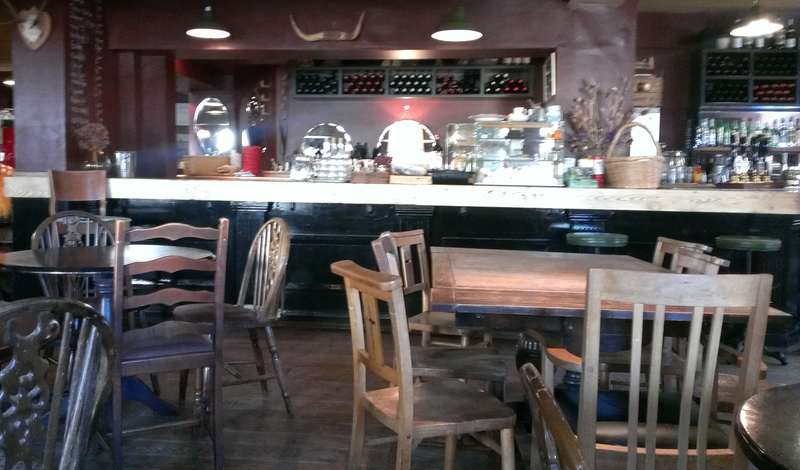 I would say this is a gastropub for the grown-ups to enjoy on their own rather than with their little darlings.